Individual students were quizzed on a number of topics, including earning income, buying goods and services, saving, and using credit, while the team competition dealt with investing, protecting, and insuring. Bellaire competed against a team from Ohio in the final round of the competition, a quiz-bowl-style event, and won 11-10. 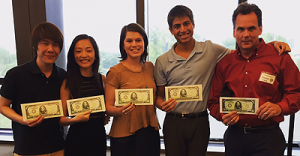 The students and their coach, Michael Clark, each received a $1,000 cash prize.